Nearly a decade after the Great Recession stalled construction nationwide, the industry is roaring back: In 43 states, construction is now contributing more to the economy than it did in 2010, creating a demand for skilled workers and transforming skylines from Boston to Oklahoma City. Overall, the construction industry’s impact on U.S. gross domestic product has grown by more than 21 percent since its low point in 2011, according to a Stateline analysis of inflation-adjusted data from the U.S. Bureau of Economic Analysis. This year, construction’s contribution to the U.S. economy soared above $650 billion for the first time since 2008. The only states that haven’t experienced construction-related economic growth since 2010 are Alabama, Alaska, Arizona, Maine, Mississippi, New Mexico and Wyoming. Three of the seven states — Alaska, New Mexico and Wyoming — have economies that are closely tied to slumping energy markets, and Alabama, Alaska, Maine, Mississippi and New Mexico have experienced slow population growth. 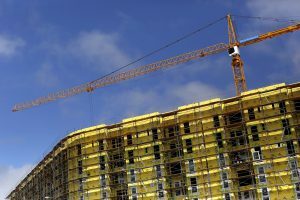 “Population growth accounts for a great deal of construction work,” said Alex Carrick, chief economist for ConstructConnect, an organization of construction professionals. Arizona has had relatively robust population growth and it isn’t heavily reliant on energy, but it has been hampered by the Phoenix housing market, which more than other cities was overbuilt in the housing bubble, Carrick said. About 6.7 million people were employed in construction last month, up from a low of 5.4 million in January 2011. In 2006, at the peak of the last housing boom, the industry employed 7.7 million people. To a large extent, the surge reflects pent-up demand, according to Kim Kennedy, manager of forecasting for Dodge Data & Analytics, which studies the construction industry in North America. In 2010 and 2011, in the aftermath of the recession, there were fewer apartments and other buildings constructed than at any other time since the late 1960s, Kennedy said. “The industry is still struggling to regain what it lost and after five years of expansion, still hasn’t made it back,” Kennedy said. Millennials — who were born starting in 1982 and often have a taste for city life and are willing to move in search of work — have helped fuel a boom in apartment construction, especially in Colorado and on the West Coast. Cheap natural gas is spurring the construction of fertilizer plants in the Midwest, and numerous data centers are going up in Nevada and California, said Brian Turmail of the Associated General Contractors of America (AGC). Recession-delayed work on roads, bridges and other infrastructure also is fueling the increase, he said. As the building of new housing, offices and roads continues apace, many construction firms are struggling to find enough workers, especially skilled workers such as carpenters and electricians. In a 2015 survey by the AGC, 86 percent of respondents reported having trouble filling available positions, up from 81 percent in 2013. California firms also face serious workforce challenges, according to Ed Coghlan of the California Economic Summit. The construction boom offers opportunities for the 30,000 energy workers displaced by the sharp decline in oil and gas prices since December 2014. But many will require additional training for the construction jobs that are available, according to Tyson Conrad, a Florida consultant who recruits electricians for builders. Some builders are calling for states to create or expand vocational training programs as a way to produce more skilled construction workers, many of whom retired or moved on to other professions when the industry shed more than 2.2 million jobs between 2007 and 2011. In a 2015 report, the AGC complained that the national decline in manufacturing has prompted many high schools to de-emphasize the trades in favor of college preparation. “The consequence has been the overwhelming impression among youths, their parents and teachers that career and technical education is unacceptable, despite the fact that construction jobs often pay better than many post-college options,” the organization argued while calling for more vocational education. Construction has been one of the few bright spots for states such as Oklahoma and Iowa, where steep decreases in oil and grain prices have hampered the overall economy. Oklahoma City is having its biggest year for downtown construction since 1930, said Steve Lackmeyer, the author of five books about the history of the city. The new construction, which includes apartments and a proposed convention center, helped boost construction-related employment by 7.7 percent since last year, the largest increase of any economic sector. Iowa raised “road use taxes” on gas and car registrations last year, allowing long-delayed road construction to start statewide. In addition, a 2008 increase in the statewide sales tax is providing $1.5 billion annually for school construction and repair, said David Swenson, an economist at Iowa State University. Even though two-thirds of Iowa counties are losing population, cities like Des Moines, Iowa City and Ames are seeing strong demand for new housing, Swenson said. Fertilizer plants fueled by natural gas also are under construction, as are wind farms and ethanol plants. On the other side of the country in Boston, “one of the three biggest building booms in the city’s history” is underway, according to Nick Martin of the Boston Redevelopment Authority. Martin said the $6 billion in development his agency has approved this year is comparable to the boom of the 1970s and the giant landfill project that created the city’s famous Back Bay neighborhood in the 19th century.